In March 2019, the PCS team participated in the FTE B Passenger and Freight Traffic Conference in the beautiful city of Ljubljana, helping to reach the main objectives (to harmonise international offers for timetable 2020 between the railway undertakings (RUs) and infrastructure managers (IMs) to prepare requests for the feasibility studies). PCS users had the opportunity to get onsite support, and were able to fix various PaP issues in dossiers on the spot. The PCS team also got involved in the TTR IT national implementation and showcased the current status twice a day at the event. The CMS migration continued and the area of Train Performance Management was migrated to Filedepot. In addition, the PCS team investigated the National Code List and updated the PCS maintenance area with the new Sprints (23). 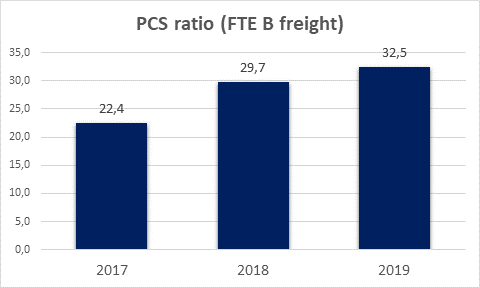 Throughout the month, the PCS team was continuously working to meet customers’ growing demands, and helping to bring global applications together by establishing a connection between RNE Big Data and the PCS. Currently, data analysis and validation is in progress. For the PCS-CIP (Customer Information Platform) connection, a graphic representation of the number of PaPs in CIP is planned. The first report has already been generated, data quality checks are ongoing. The team’s work continued with ECMT (Electronic Capacity Model Tool) developments, where the main goal is ensuring the graphical presentation of the capacity model. As a result of continuous implementation work, a new geographical map was designed in the ITNDB tool. The update includes a new, larger version of the European map with borders and connections drawn in thinner lines. In March, RNE also sent out customer feedback surveys. The feedback gained through these surveys provides valuable input for RNE’s aim to meet customers’ expectations and deliver a first-class, excellent customer experience across Europe. In the questionnaire, customers had the chance to rate the Service Desk response – resolve time, quality of answers, overall experience – and add additional comments to improve RNE’s services in the following areas: PCS, CMS, TIS, CIS and CIP. In terms of ongoing user support, the PCS team has assisted 80 times in various issues, mainly with user access requests, password resets, modifying PaPs in dossiers and questions regarding subsidiaries.